Japan says it understands President Donald Trump’s cancellation of the summit with North Korean leader Kim Jong Un. Top officials there say talks should be held when progress on the North’s denuclearization is achieved. Chief Cabinet Secretary Yoshihide Suga said Friday the summit is useful only when it makes progress on the North’s nuclear and missile abandonment and on the issue of the North’s abductions of Japanese citizens. Trump cited hostility in recent remarks from North Korea when he canceled the summit on Thursday. Japanese Foreign Minister Taro Kono, in Mexico for talks with officials, said Japan expects a summit where North Korea can commit to denuclearize itself. He said Japan will keep cooperating with Washington to achieve it. Singapore says it regrets the cancellation of the summit that was to be held there next month between President Donald Trump and North Korean leader Kim Jong Un. Trump on Thursday abruptly canceled the meeting because he found earlier comments by a North Korean official to be angry and hostile. North Korea responded Friday that it was willing to give the U.S. time to reconsider and was ready to meet anytime. Singapore had been selected recently from among several locations that were considered, including the Demilitarized Zone between the Koreas where Kim meet South Korean President Moon Jae-in last month. North Korea says it is still willing to sit down for talks with the United States “at any time, at any format” after President Donald Trump abruptly canceled his planned summit with Kim Jong Un. Vice Foreign Minister Kim Kye Gwan issued a statement Friday saying North Korea is “willing to give the U.S. time and opportunities” to reconsider talks. South Korean President Moon Jae-in says he’s “very perplexed” that the U.S.-North Korea summit won’t go ahead as planned. Yonhap news agency cited Moon as urging direct talks between President Donald Trump and North Korea’s Kim Jong Un. Moon met Trump in Washington on Tuesday, but appeared caught unawares by the president’s decision Thursday. The White House says the North Korean government violated several promises to the U.S. and South Korea related to the now-cancelled June summit in Singapore between the U.S. and North Korea. A senior U.S. official says the North Koreans stood up an American delegation last week seeking to make arrangements for the summit and did not return messages from the U.S. seeking to discuss the meeting. The official says the North also reneged on a pledge to allow international inspectors to monitor the supposed demolition of its nuclear test site Thursday. International journalists were present, but the U.S. government can’t verify the site’s destruction. The official spoke on the condition of anonymity to avoid overshadowing Trump’s comments Thursday. Russian President Vladimir Putin says North Korea had fulfilled its promises ahead of the planned summit between President Donald Trump and Kim Jong Un. Trump canceled the summit on Thursday, citing “hostility” from North Korea. He spoke at a news conference with French President Emmanuel Macron. Donald Trump’s letter to North Korean leader Kim Jong Un was dictated by the president to his national security adviser, John Bolton. That’s according to Republican Sen. Cory Gardner, who met with Bolton at the White House on Thursday, hours after Trump announced he was withdrawing from a planned summit with Kim next month. Gardner told The Associated press that Bolton described the letter as a “wake-up” to Kim, who had shown a change in attitude after meeting with Chinese President Xi Jinping. The senator cited the North Koreans’ refusal to return phone calls to the administration and turning down high-level talks with South Korea. He said North Korea had shown a “lack of seriousness” in negotiating on denuclearization. In the letter, Trump cited “hostility” from North Korea, but kept open the possibility for dialogue. Pentagon officials say American forces on the Korean peninsula remain on a normal state of alert in the aftermath of President Donald Trump’s decision to cancel his planned summit with North Korea’s leader. Trump said he had spoken to Defense Secretary Jim Mattis about the cancellation and that the U.S. military is prepared for what he called a “foolish or reckless” act by the North. A spokesman for the Pentagon’s Joint Staff, Lt. Gen. Kenneth McKenzie, told reporters the U.S. military will be ready for any North Korean provocation such as a missile launch. But he said the state of vigilance by the U.S. military in South Korea has not changed, with no new preparations or actions since Trump’s announcement. He said U.S. forces are in a “boxer’s stance,” prepared to defend themselves and South Korea. President Donald Trump says he thinks Kim Jong Un wants to do “what’s right” but says it’s up to the North Korean leader to seize the opportunity. Trump says the dialogue between the U.S. and North Korea was good until the North shifted back to its usual belligerent tone. The president says he understands why that happened, but declined to elaborate. 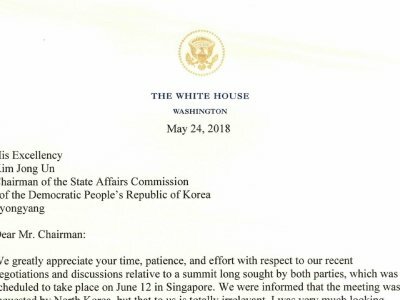 Trump has canceled a summit with Kim planned for June 12 in Singapore, but has left the door open to meeting on that or another date. Trump opened the door for diplomacy Thursday just hours after he canceled a summit with Kim scheduled for next month in Singapore. But he insisted that Kim reach out, placing the blame on the North Korean leader for the collapse of negotiations. Trump and Kim had been slated to meet June 12 for what White House officials had hoped would be a historic diplomatic breakthrough for the president. They advised that the summit could be rescheduled. President Donald Trump says the U.S. military is “ready if necessary” to respond to “foolish or reckless acts” by North Korea. Trump on Thursday announced he has called off a planned June 12 summit with North Korea’s leader, Kim Jong Un, citing recent hostile statements by Kim’s government. Secretary of State Mike Pompeo says he was involved in discussions late Wednesday and early Thursday that led to President Donald Trump’s decision to pull out of a planned summit with North Korean leader Kim Jong Un. But, he would not say exactly which, if any, other countries were given a head’s up on the decision, including South Korea. However, Pompeo, who met at the State Department on Wednesday with China’s foreign minister, did say that he had not spoken to Chinese officials since the decision was made. A prominent Russian lawmaker says the cancellation of the planned summit between President Donald Trump and North Korea’s Kim Jong Un is a serious setback. A Republican senator often critical of Donald Trump says the president “made the right call” in canceling a summit with North Korea’s leader. The U.N. chief says he is “deeply concerned” by the cancellation of the planned summit between U.S. President Donald Trump and North Korean Leader Kim Jong Un. Guterres’ comments came as he laid out his disarmament agenda, warning that nuclear agreements between states have been threatened like never before. House Speaker Paul Ryan says achieving a peaceful resolution to the nuclear standoff on the Korean Peninsula will require “a much greater degree of seriousness” from Kim Jong Un. Ryan says in a statement Thursday that Kim’s government has long given ample reason to question its commitment to stability. The Republican says that, until a peaceful resolution is achieved, Congress has provided “significant tools” to hold North Korea accountable. Ryan says the U.S. must continue the “maximum pressure” campaign that Trump and others say brought North Korea to the table in the first place. Secretary of State Mike Pompeo says North Korea did not respond to repeated requests from U.S. officials to discuss logistics for the now-canceled summit between President Donald Trump and North Korean leader Kim Jong Un. Pompeo told the Senate Foreign Relations Committee on Thursday that the lack of response was an additional reason for Trump’s decision to call off the meeting. Trump cited recent bellicose comments from the North in a letter to Kim released by the White House. Pompeo says the North’s attitude changed markedly since he returned from a trip to Pyongyang earlier this month, when he met with Kim and secured the release of three American prisoners being held there. A senior Democratic senator says President Donald Trump’s withdrawal from a planned summit with North Korea shows the consequence of his failure to prepare properly. Menendez was speaking Thursday at a committee hearing attended by Secretary of State Mike Pompeo.